The ports, islands, and historic forts of the Pertuis d'Antioche are even more impressive from above. 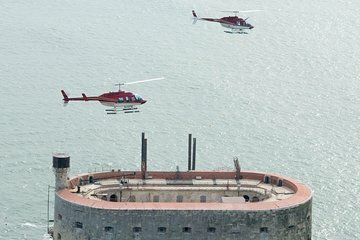 This 20-minute helicopter flight from Rochefort soars over Île Madame, the La Pointe and Lupin sea castles, and the mighty Fort Boyard, where the eponymous TV show is filmed. Make your own way to the Aerodrome de Rochefort in time for a 3pm, 3.25pm, or 3.30pm flight departure (depending on option selected). After meeting your pilot and listening to the safety briefing, jump aboard the helicopter and set off west towards the coast. Follow the scenic Charente River estuary, passing over the Île Madame, and the castles of La Pointe and Lupin. As you swoop low over Fort Boyard, listen as your pilot recounts the fascinating history of the sea fortress and learn how it became the setting for the famous French TV game show, Fort Boyard. Loop back towards the shore, enjoying magnificent views of the Île d’Aix and the seaside town of Fourras, before coming back in to land at Rochefort.